The new Airspy HF+ SDR receiver has now been shipped to multiple customers and reviewers, and new reviews are coming online fast. 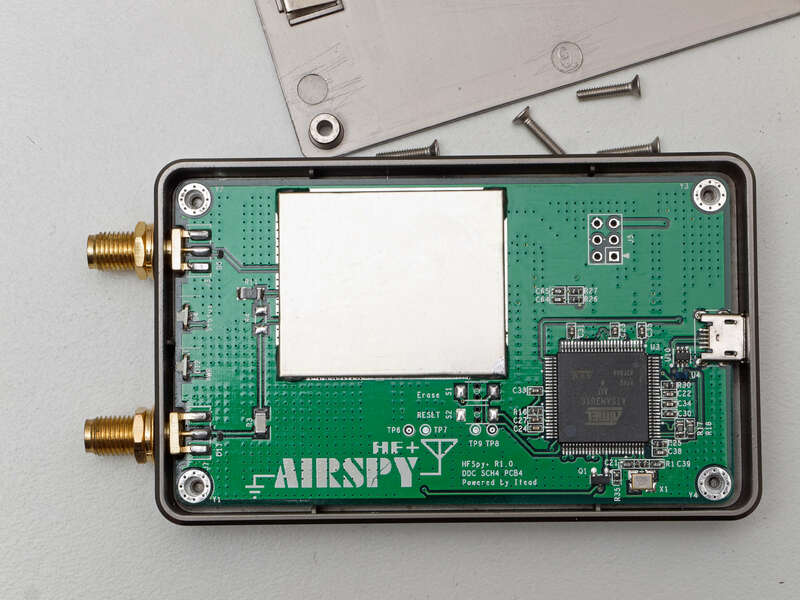 If you weren't already aware, the Airspy HF+ was a hotly anticipated low cost, but high performance HF speciality SDR receiver. The claims are that it can compete with the high end $500 US+ units. We have our own review of an early model here. Below are some new reviews that we are aware of. Nils DK8OK's photo of the Airspy HF+. On his blog Nils presents us with a comprehensive set of audio recordings comparing the $525 US Elad FDM-S2 with the $199 US Airspy HF+. He compares the two receivers on various shortwave broadcast stations, time stations, and an airport VOLMET. The recordings are identical, with the two radios recording the same signals simultaneously via a splitter. Both receivers produce excellent results so you will probably need headphones and keen ears to be able to tell the difference. In this video I am comparing two high quality SDR Receivers: Airspy HF+ and ColibriNANO. They both have 16 bit Analog-to-Digital Converter. Comparison was made with the same overall conditions. For example, both receivers was set with equal size spectrum windows, with the same amount of decibels in their scale, and the same high of the spectrum windows. ColibriNANO has LNA gain slider which was set to maximum SNR. Airspy HF+, on the other hand, has no LNA gain control. Antenna is half-wave resonant Dipole (40 meters long) for 80m band. In the second part of the video I was inserted 27 dB external Attenuator on both receivers. ColibriNANO automatically increased the LNA gain and sets itself to maximum SNR. With this amount of attenuation, The Airspy HF+ noise floor level was at about the same place in spectrum window like ColibriNANO, Unlike in the first part of the video, when no external attenuator was used. Airspy HF+ is superb High-Dynamic HF and VHF SDR-receiver and I am impressed with it. In order to minimize possible negative effect on signal path from antenna connector to tuner input, Airspy HF+ has no internal attenuator. Developers takes in account that this SDR-receiver has enough dynamic range that is very difficult to overload it. Actually it is true for most cases. But, if we want to use some type of active antenna (with internal amplification) like Mini-Whip Active Antenna for example, it is good idea to add an external attenuator between antenna and receiver HF-input connector, in order to have opportunity to lower the signal level from the active antenna, and to avoid possible overload issues. In this video I am presented some scenario (receiving MW AM band) when my homemade external step-attenuator is more than welcome! By the way, the external step-attenuator is very easy to made in almost no money. All you need is 9 resistors, three switches and one metal box) I have 5.5 dB switch, 10.5 dB switch and 22 dB switch. It can be set for 8 various combinations: 0, -5.5 dB, -10.5 dB, -16 dB, -22 dB, -27.5 dB, -32.5 dB and -38 dB. You can see on this video that the AM Broadcast signal from Macedonian Radio on 810 kHz is very strong. The Antenna is about 30 km from my house. It is self standing huge 185 meters high vertical antenna, radiating enormous RF-power, so I have to use my homemade attenuator I mentioned it before. Here Thomas of the SWLing post blog has posted a brief review of his HF+ unit. He notes how the HF+ is very compact, with a durable enclosure and how easy it was to set up with it being completely plug and play. So far Thomas hasn't fully evaluated the performance, but his first impressions are good. In his two videos Adam doesn't directly review the Airspy HF+, but he does show some pretty impressive reception with his Skyloop antenna. This review by RadioHobbyist just came online shortly after this post went out. It compares the HF+ against the expensive $1449 US NetSDR using sound samples from both radios. The difference between the two radios is almost undetectable. Any updates on the shipping date? This is just cruel I can no longer wait!